Although I just adore Laurel & Hardy, I can't say that I was very amused by this early attempt of the two. It's definitely true that this movie can't really be labeled as a Laurel & Hardy movie, since they don't appear in this movie as a comical duo. They play two separate roles, although they also interact with each other during some of movie its moments. It's one of the earliest movie starring the two boys. Their later trademark style of slapstick humor and chemistry is not yet fully notable in this movie. Instead the movie features some highly predictable and far from original comedy moments. The movie isn't even ashamed to recycle some of its own jokes time after time. Of course it's true that the movie also does have its moments. It's still fun enough to consider this a watchable movie but I have the feeling that Laurel & Hardy fans will probably be disappointed with this movie. It's not a movie that made me laugh a lot, though I think I smiled a lot. Especially the moments with the 'baby' were amusing. Kind of spooky to find out that the 'baby' was actually being played by an actual adult. Freaky! The movie is a bit longer than other Laurel & Hardy silent comedy shorts. The movie is 26 minutes long (so the 20 minutes runtime shown on this site is false!). It definitely shows on screen that this movie is longer than average. Some moments are overlong and tiresome. Seemed that 20 minutes was really the ideal length for a comedy short, at that time period. Perhaps if the movie had been shorter, I would also had been more positive about it. 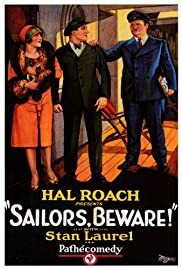 Obviously the boys and Hal Roach were still searching for the right comedy style, timing and pacing. This movie just does not yet fully show the Laurel & Hardy we all love.